1. The board adopts immersion gold process. All the gold plate hole spacing, both for the standard 2.54mm (100ml). Compatible with the DIP IC package is directly welded on the upper end of prototype experiment. 2. Extended IO port, can be directly use in bread lines inserted row, convenient use, fast to your creation in the extended edition prototype implementation. 3. IO port with a terminal output. When connected to an external module, can turn ordinary wire tightening on the wiring column. Suitable for raspberry pie and the external module, routing link. 4. 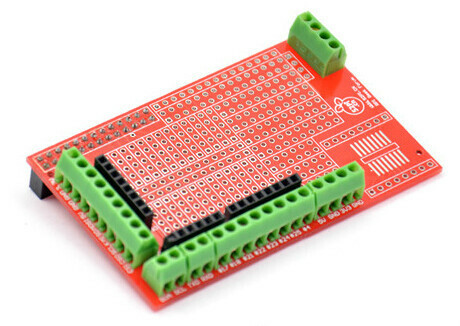 Raspberry pi as the board level drop element, support more difficult. In this section, the custom row and silica gel pad as a prototype board support. This product contains only a raspberry pie prototype expanded version of the Prototyping Pi Plate. Does not contain the bread plate, below demonstrates the use of line and chip. Note: It only has the Prototyping Pi Plate, not include other items.